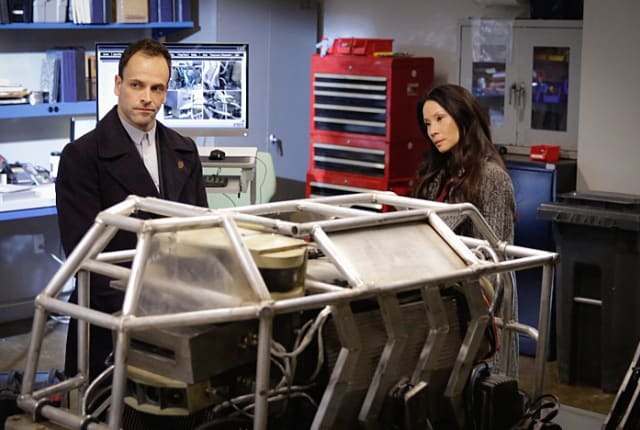 On Elementary Season 4 Episode 16, Holmes and Watson investigate the death of a man who was seemingly chased to death by a large, glowing animal. When you watch Elementary Season 4 Episode 16 online, a wealthy businessman names Charles Baskerville runs for his life from an unseen creature. Unfortunately for him, he runs onto a roadway and is promptly flattened by a truck. His brother Henry, wisely suspecting foul play, enlists the assistance of Sherlock and Joan to investigate. It isn't long before the duo finds signs that something isn't right. A witness insists that a large creature was chasing Charles. What's more, it was apparently glowing in the dark, too. This sets the pair on a trail that leads them to suspect that someone might be after the Baskerville family fortune. Either that, or Charles managed to upset someone with his business practices. Whatever the reason for Charles's death, it soon becomes obvious that Henry might well be a target, too. It's up to Sherlock and Joan to figure out what exactly is going on and what in the world chased Charles to his death -- before whatever it is has the chance to do the same thing to Henry. And time is running out... Find out what happens when you watch Elementary Season 4 Episode 16 online, right here! Sherlock: It's the first Thursday of the month! Joan: Wait, you're leaving to go play chess?! Permalink: Wait, you're leaving to go play chess?! Sherlock: It's a brag made of brick, stone, and drywall. Sherlock: Small wonder that your father and mine were friends. Permalink: Small wonder that your father and mine were friends.